Largest end dump style available, ideally suited for utility contractors and municiplities. 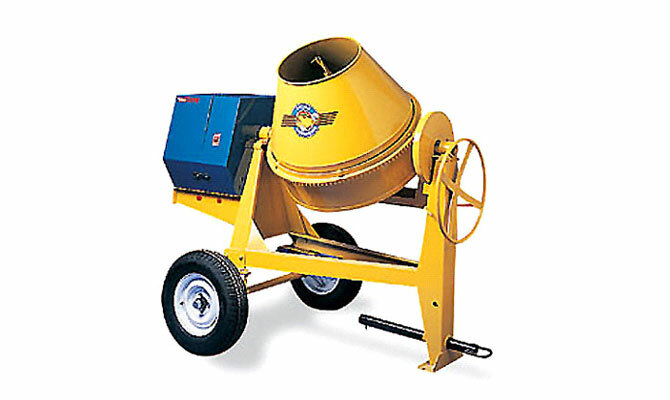 Carry mixing supplies from job to job and mix concrete from the truck. Large 9 cu. ft. capacity batch. Towing tongue has flip-up post for extra clearance and stabilizer leg at opposite end, pin type hitch, 76" wide axle has cantilever type springs complete with B78 x 13 (25" dia.) high speed tires and safety chain, 24" dia. handwheel, chain drive and dump lock, spacious cowl for maximum ventilation. A generous 9 cu. ft. capacity for large batches. 24" dia. handwheel, chain drive and dump lock, spacious cowl for maximum ventilation.